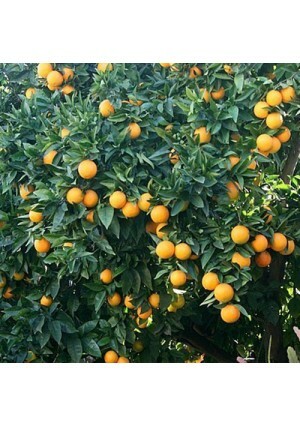 Valencia Oranges are very sweet and mainly used for juicing. The fruits usually have about 6 seeds per fruit. The fruit has an average diameter of 2.7 to 3 inches. The Valencia is cold hardy in USDA Growing Zones 9-11. The tree can be kept as a container-grown plant in all other growing zones if it is brought indoors for the winter. It is highly recommended that you keep this tree in temperatures ranging from 55F to 70F. The fruit stores well on the tree and usually carries two crops (old and new). Valencia Oranges are the absolute best oranges for making juice for your favorite cocktails!